When I was a child, two of my favorite books were about trains. One was called Little Toot and the other was The Little Engine That Could. It seems like I've always had a special interest in trains. I enjoyed watching electric trains in store windows during Christmastime, and begged my parents for an electric train set of my own. As a boy I made several train trips on the Santa Fe lines from the West Coast to the East and loved every minute of it. Trains can teach us come important lessons about life. Trains leave from stations, run on schedules, wait on other trains while en route, have stop and go signals to obey, and carry important cargo to various destinations. Trains also need upkeep and maintenance. Like a train, your life has a starting point and a final destination. It runs on a divinely appointed schedule and makes important stops along the way. People move in and out of your life like passengers would on a train, and there are stoplight and go lights along the way. You have a powerful engine, the Holy Spirit, who moves you along the tracks of faith and obedience, and like the train, you are well kept and maintained by God's Word. God, like a skilled engineer and the owner of the line, is the One who makes your schedule and keeps everything running on His timetable. He knows when you need to leave a station in life and when you need to arrive at the next one. Along the way He brings people in and out of your life so that you can minister to them and they can minister to you. God is also in your stops and starts, and although your journey may sometimes seem slow, God knows exactly where you are and what He is doing. Today is your best day because you are exactly where God wants you to be in this phase of your journey. It may be that you are waiting for Him to fulfill His promise to you, or you are anxious to move into something new, but God wants you to wait on Him until He is ready to fulfill what He has promised. 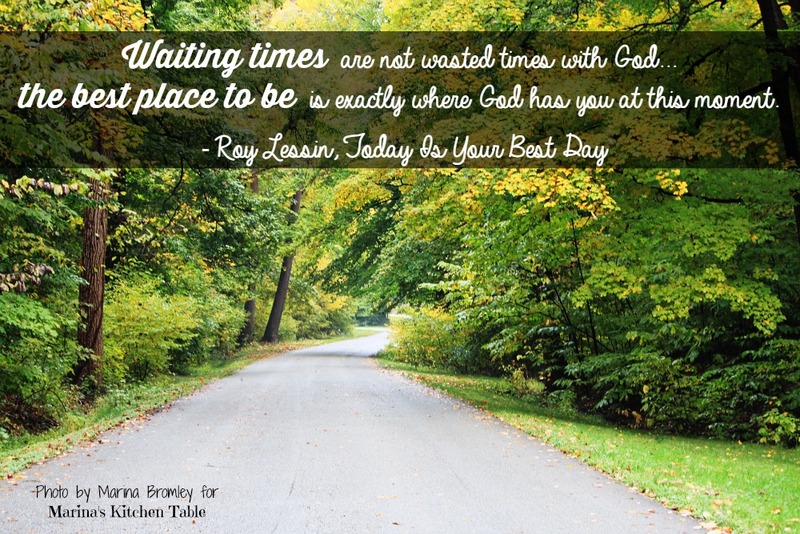 Waiting times are not wasted times with God. While you are waiting, it does not mean that God is not working. There may be some dangers up ahead or some obstacles on the tracks that first need to be removed before God moves you on in His will. Today if you are waiting at a station or moving on, full speed ahead, the important thing to remember is that the best place to be is exactly where God has you at this moment.